When the phone in the tent rang just minutes before the time for the afternoon game-drive, I knew in advance what the conversation would be about. Not long after arriving at the Selous Luxury Camp of Serena Hotels, the mandatory briefing of do’s and do not’s and some light lunch had the skies opened up with a vengeance. I had just reached my tent, unpacked what I planned to wear, put the camera batteries on charge, spares included and was pondering what to do next. The four poster bed looked very inviting to take a nap but I thought the better of it. Grabbing two pillows and the spare blanket I made myself comfortable on the outside deck’s lounge chair, which allowed for fresh air and a view down to the ponds. Bird calls were soon joined by ‘Frogland Sings’ as if the two species were in a contest for a recording contract, interspersed by a few grunts of hippos some distance away. The rain pounded the thatched roof quite heavily for a while before settling into a steady downpour, an oh so perfect combination to close my eyes and drift into a state of being semi awake, aware of what was going on around me and yet allowing for dreamlike scenes unfolding in my mind, of past visits to the Selous, that last one two decades ago and what to expect this time. The phone call put a sudden end to that blessed state of mind and body, and as I anticipated did my guide Christopher in a very apologetic voice tell me that the drive had to be cancelled due to the ongoing heavy rain. He would go out with me he said, if I insisted, but knowing some bushcraft and being able to read the signs, the terrain, made largely of black cotton soil, would under such weather conditions have not just gotten us stuck to the axles but even made a rescue unlikely while daylight lasted. The decision was reached in a split second, leaving the wallowing in the mud to the buffalos, warthogs and other game better suited to this sport and not having to worry about dry cleaning bills or buying new boots, the old ones stuck two feet deep in the mud somewhere. ‘We stay put’ I told him before ordering some afternoon tea and finger sandwiches, to see myself through till supper time. Back on the lounger, a pot of steaming tea next to me, I decided to take some notes, recollections, scribbled questions which my readers no doubt would want answers for, and quietly hoping for better weather the next morning. The Selous Game Reserve is Africa’s largest and the nearest airstrips are just a 40 minute flight away from Tanzania’s commercial capital of Dar es Salaam. The reserve is named after Capt. Frederick Courteney Selous, who was born on New Year’s Eve in 1851 and became a veritable adventurer in his lifetime. He first set foot into Africa as the age of 19 and then spent nearly 20 years in South Africa and what was later to become Zimbabwe and Zambia. In 1890 he joined Cecil Rhodes’ British South Africa Company before returning home to England in 1892 to receive high honours from the Royal Geographical Society for his written journals titled: ‘Twenty Years in Zambesia’. During these years he became a friend of Cecil Rhodes and Theodore Roosevelt, whom he accompanied on sections of that famous hunting safari America’s former President undertook between 1909 and 1910. A year later, in 1893, he returned to Africa to fight in what became known as the First Matabele War when he was wounded on the advance to what today is Bulawayo. Returning home to recuperate he got married while in England but soon after, in 1896, returned to settle in Matabeleland and fight in the Second Matabele War. The outcome of the Berlin Conference, at the end of which, on 26th February 1885, Africa was divided between the colonial powers of the day, Britain, France, Germany and Portugal, would 30 years later drag Selous back into war. Aged 64, he rejoined the British Army to fight in the main African theatre of World War I. German Tanganyika and what today is Rwanda and Burundi on one side and British Kenya and the Belgian Congo on the other side were soon embroiled in action and Von Lettow Vorbeck’s combined force of German officers, NCO’s and African riflemen gave the British a bloody nose in the Taita Taveta area of Kenya. Later in 1915 they withdrew from their fortified outpost near Taveta and in a cleverly thought out strategy pulled the Allied pursuers deeper and deeper into the wilderness of Tanganyika. It was at BehoBeho Hill on the 04th of January 1917 that Capt. F. C. Selous was killed in action and he was buried nearby, later on being honoured when the game reserve was established and named after him in 1922. The nearly 55.000 square kilometre large game reserve was made a UNESCO World Heritage Site in 1982. Enough though of the history lesson and back to my present day visit to Tanzania and the Selous Game Reserve. More often than not I have come to realize that visitors to Dar es Salaam, on business or for conferences, do make an effort to visit Unguja, Zanzibar’s main island, or even go to Mafia Island, for deep sea fishing or diving but when it comes to taking a safari, most seem to think they need to fly all the way to Ngorongoro or the Serengeti. Yet a 40 minute flight from Dar es Salaam’s safari terminal of the international airport delivers one right into the main tourism zone of the Selous, for a night, for a weekend or for a week during which every day is action filled and will become unforgettable. I opted for the weekend trip, spending one night each at the two Serena properties, one a luxury tented safari camp and the other one an equally luxurious lodge, perched high up on the banks of the Rufiji River. Planned was an exploratory game drive on the afternoon of the arrival day, which as earlier mentioned turned into an involuntary washout, allowing for some extra time to explore the camp. The 12 tents are not the largest on the market but very tastefully furnished and stylishly appointed and reminded me of the saying that often less is more. In fact, in contrast to some other tented camps seen in the more recent past the Selous Luxury Camp taught me almost a lesson in simplicity compared to what other camp owners try to squeeze into their oversized tents with at times an opulence almost ending up as oppressive, losing sight of the essentials of luxury, showing off ‘Nouvelle Riche’ style and in the process overdoing it. I could say luxury is inherent with Serena but done with such style that everything is in the right place and with the right measure. The spacing of the tents ensures that guest have the privacy they expect, or hope for. Facing the semi-permanent river – the deep pools provide a home for hippos year round – is every tent nestled under the trees for shade. The deck of the main building, as does the pool, provides an equally good view across the river and often allow for hippos to be seen close up and personal from a safe vantage point. Electricity in the camp is available 24 / 7 though when the generator is taking a rest, inverter batteries take care of the lighting which is however limited during the night hours to the bathroom, the bedside lamps and one of the sockets, so that batteries can be charged overnight. Free Wi-Fi for guests ensures connectivity with the outside world and extends across the main building and the nearest tent on each side of it. And I could not agree more, it is a place which can induce happiness, perfectly located, quiet, sophisticated, the staff at one’s beck and call, services provided with genuine smiles and no culinary desire is left wanting. The night was cool after the heavy afternoon downpour but once in the tent – guests are accompanied by staff with torches to provide ‘safe conduct’ – one can easily warm up as there is a kettle, teabags and powder coffee, creamer and sugar to keep the body warm before slipping under the duvets. Once the lights in the tent go out – the pathways outside remain lit all night of course – do the sounds of the wilderness take over. The snorting of hippos, most of the time friendly, can suddenly change from a frolicking mood to fierce warnings when they feel their territory is invaded or their young are threatened. Crickets and frogs start their concerto, their sounds at times dying down before resuming with a vengeance. The calls of the birds soon die down, giving way to the distant laughter of hyenas but no cats were heard during the night I spent at the Selous Luxury Camp. At the crack of dawn on day two was the early morning tea delivered, as requested set down on the coffee table on the deck outside the tent, moments best enjoyed on the lounger to watch the daylight unfold. Breakfast turned out to be another a la carte affair, all choices available and served promptly. With a full day out in the bush planned, to make up for the washed out game drive of the previous afternoon, the Kwaheri Ya Kuonana came far too soon. I left with much regret, wanting to stay longer, envying guests who had written in their comments that they felt the same way after spending a week in this camp. The secluded setting and the availability of all facilities to make for a 5 star stay make the camp an ideal base to explore the reserve and the lodge management is happy to arrange for anything from a bush breakfast to a bush lunch to High Tea, also served in the bush. It is the sort of logistics one comes to expect from Serena and a guarantee that day long game drives do not have to come at the expense of missing a decent meal. The Selous Camp, after just a night, found itself ranked alongside such other personal favourites across the border in Kenya like Kitich, both places where the magic of the African wilderness leaves indelible marks on one’s mind and soul. The drive across the reserve on the back of an open Landcruiser 4×4 proved exciting for me and a fellow traveler who had decided to tag along and instead of spending two nights at the camp decided to also sample the Mivumo River Lodge. The skills of our driver guide Christopher, who got us close to the game and was very knowledgeable about birds too, did not prevent us from getting stuck in the mud, almost inevitable in the rainy season. Undeterred did we bring forward our picnic lunch, set up the canvas chairs and a table under a shade tree and indulged while the rescue party made its way to our location to pull our vehicle out of the mud. When eventually we drove on we were rewarded with plenty more game sightings and to our surprise an entire flock of Ground Hornbills, taking to the air no less as we approached, flying deeper into the bush. But as the day advanced did storm clouds begin to move in on us again, prompting our guide to roll down the canvas around the vehicle cabin, driving the last few kilometres to our new abode for the night, the Mivumo River Lodge, in pouring rain. 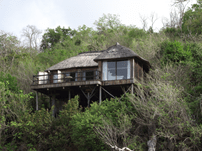 Set high on the bank over the Rufiji River does the lodge comprise only 12 chalets (and a Presidential Cottage set slightly apart from the main lodge) and clearly no expense was spared to make this property the proverbial non plus ultra of safari accommodation. The air conditioned suites, one cannot call these rooms anything else, open to a private deck where besides an open air shower a small hot tub awaits guests, allowing those who travel in pairs to frolick outdoors, from dawn to dusk as time between the usual safari activities permits. The main activity from Mivumo are the boat trips on the river, either going upstream towards Stiegler’s Gorge where the wild whitewater makes any further advance impossible, while when going downstream from the lodge does the river begin to meander along, lined by high sandbanks which provide for unique picnic spots. It is the river experience which makes a stay at Mivumo so unique. A constant stream of game comes during the dry season to the river to drink, of course wary of the ambushes laid by crocodiles and bolting at the slightest movement in the water. Birds galore can be seen, from Fish Eagles to Kingfishers to Storks and dozens of others. Colobus monkeys are regularly observed from the boats, as are hippos and crocodiles, big and small, either in the water or basking in the sunshine on the sandy river banks. Visitors to the Selous, especially those who have prior safari experience, come back with a thumbs up for their experience. While not a national park, the reserve can truly claim its place among the great parks in Eastern Africa. Those who have seen the great migration in the Serengeti, or the Masai Mara depending on the time of year, those who have been to Ngorongoro Crater and return to East Africa to seek something different the Selous is one place which sooner or later must be ticked off the bucket list. It is different from the other parks and yet offers more than enough to brag about when coming home and showing off their picture collection, over and above what they have already posted from on site on Twitter or Facebook. Floating almost silently on the river, when the boatman / guide turns down the engine to just have it tick over, ready to accelerate should it be necessary, and seeing a herd of elephant emerge from the thickets and assemble on the river bank to still their thirst, is nothing short than spectacular. Floating by the hippos and crocs too, while hair raising for some, provides the thrill tourists seek and the pictures to prove that indeed they were within touching distance of these beasts. Most visitors, from what I was told by the staff at the lodge and at the camp, would stay two nights, doing the conventional game drive one day and the river excursion the next. Yet, and I have no doubt, when leaving they will all look back with regret that they did not stay longer. Ideally should a visit to the Selous last four nights, and don’t I wish that I had done that instead of rushing it with a single night here and another single night there. Of course I enjoyed my stay but was unable to fully immerse myself into the splendid isolation of the Selous Luxury Camp – a writer’s dream location I should add for the peace and tranquility and the inspiration one can draw from the location – or take advantage of the luxuries the Mivumo River Lodge offers to guests. No time for the hot tub, no time for the Spa, no time for more of their excellent meals, no time to just sit on the deck, a book in hand or just gazing across the river, no time to go back on the river in the late afternoon when a different light spiel of the setting sun gives the experience a different twist. The Selous is one of the last remaining places where, when on safari, one is not likely to see many or even any other cars, unless those taking other guests staying at the same lodge on a game drive. Not that the reserve and its lodges and tented camps are empty of tourists, but there is simply so much space to go around that everyone literally has the proverbial square mile to him or herself to explore, unlike in some other parks where one has to be lucky to have the van driver find a parking space among fifty other cars ringing a pride of lions. Here the name of Capt. Frederick Courteney Selous lives on, remember an adventurer from a century ago, when Africa was still the continent to be discovered. As it goes, there are still plenty of places to be discovered in this day and age and the Selous Game Reserve is one of those places, a priceless piece of African wilderness real estate which needs preserving for future generations. It is here that one can literally look back into time where little has changed since the days of World War I when F.C. Selous was fighting around BehoBeho for his King against the men of the Kaiser. Of course, today, unlike back then, does one hear the roar of the boat engines on the river and can see the tracks the 4×4’s leave after they hit a particularly wet patch of soil, unlike a hundred years ago when it was boot prints and spoors of horse and oxen drawn wagons which carried the supplies. In two years’ time, come the 04th of January 2017, will no doubt special commemorations be held at the grave side of Capt. F. C. Selous DCO, to remember the man who gave the world’s largest game reserve its name and to highlight the attractions the reserve holds for travelers today. It is a month since I visited the Selous and already I am scheming to return, for a longer stay, and were it possible, perhaps forever. Coming back from the Selous, I returned from there with a renewed ability to dream, something few places can inspire me to other than La Digue in the Seychelles or Nyungwe Forest in Rwanda and a handful of other places I prefer to keep to myself, for now that is. Brilliant, Wolfgang! The Selous has always been a very special place for me, and I can only hope and pray that it survives for eternity. Well thank you for your warm comment and for reading my blog! The Selous is very special and of course also very threatened.